irritated eyes. Unlike other dry eye treatments, tranquileyes naturally restore moisture by increasing humidity around the eye. This increased humidity prevents the evaporation of natural and artificial tears, improves the overall eye health by thickening the lipid layer, and may restore the eyes’ natural defense against future tear evaporation. Just 20 minutes wearing Tranquil Eyes helps to relieve puffiness and swelling and soothes dry, irritated eyes. Use them warm for dry, irritated or tired eyes. Use them cold to help with puffiness. 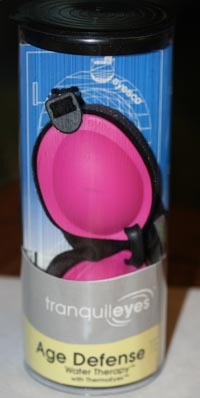 Experience tells us, the more you use your tranquileyes, the longer the relief extends beyond period of use. 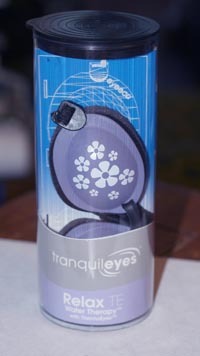 For best results, we suggest using tranquileyes daily for at least two weeks and then as needed. Each kit offered below comes with the traditional foam and also the new Thermoeyes/Thermopad combinations. 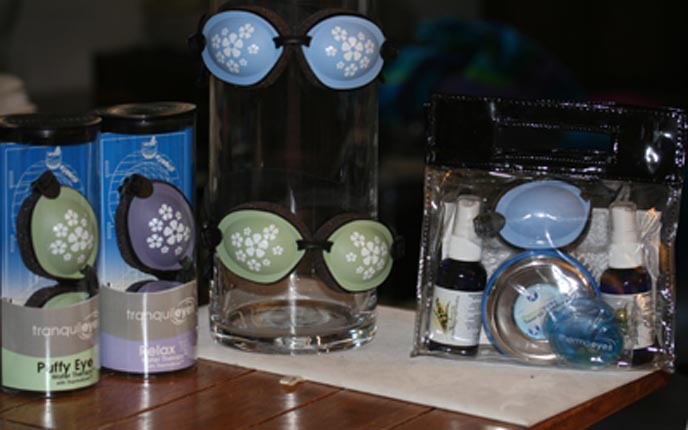 After you view all of the sets available (click on next at bottom of each page) you will see instructions on how to use this terrific eye therapy! Puffy Eye Water Therapy TE - A refreshing system to naturally relieve eye puffiness caused by lack of sleep, allergies, too much fun, or a good cry. We combine the tranquileyes cold treatment with the anti-inflammatory benefits of Cucumber and Aloe in our Puffy Eye Formula to help tone and firm skin around the eyes, reducing eye puffiness. 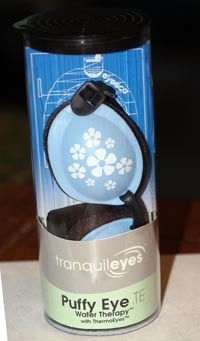 The treatment is further enhanced with thermoeyes, our reusable cold packs that are chilled, then inserted into the goggle, boosting the benefits when needed. 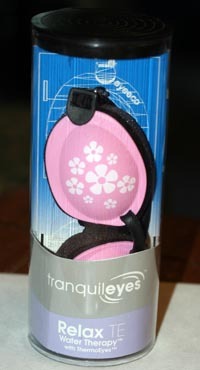 Includes tranquileyes goggle, 2.0 fl. oz. Puffy Eye Formula, one set of thermoeyes with thermopads, net dry bag and travel sack. Relax Water Therapy TE - A soothing system to naturally replenish vital moisture to the eyes and sensitive surrounding skin, leaving eyes bright and refreshed, and the entire body revitalized. 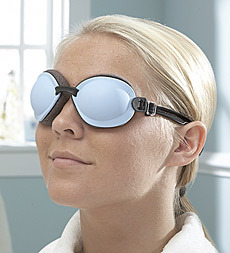 We have combined the aromatic benefits of our aloe and lavender infused Relax Formula with the therapeutic benefits of thermoeyes, our reusable heat packs that tuck inside the goggle, to boost and enhance the original tranquileyes eye hydrating therapy. Use regularly to relax and calm the mind, soothe tired, dry eyes and bestow a youthful appearance to the eyes and surrounding skin. 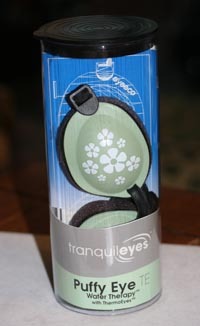 Includes tranquileyes goggle, 2.0 fl. oz. Relax Formula, one set of thermoeyes with thermopads, net dry bag and travel sack. Age Defense Water Therapy TE - A soothing system to naturally replenish vital moisture to the eyes and sensitive surrounding skin, reducing signs of aging and leaving entire body revitalized. We combine the antioxidant and skin clearing benefits of Green Tea and Honeysuckle in our Age Defense Formula with the therapeutic benefits of thermoeyes, our reusable heat packs that tuck inside the goggle, to boost and enhance the original tranquileyes eye hydrating therapy. Use regularly to intensely hydrate skin, soothe tired, dry eyes and bestow a youthful appearance to the eyes and surrounding skin. Includes tranquileyes goggle, 2.0 fl. oz. Age Defense Formula, one set of thermoeyes with thermopads, net dry bag and travel sack.